Call us mind-readers, but during the polar vortex, we bet you had the brilliant — and brilliantly evil — idea of ordering takeout in the bad weather. It made sense, right? 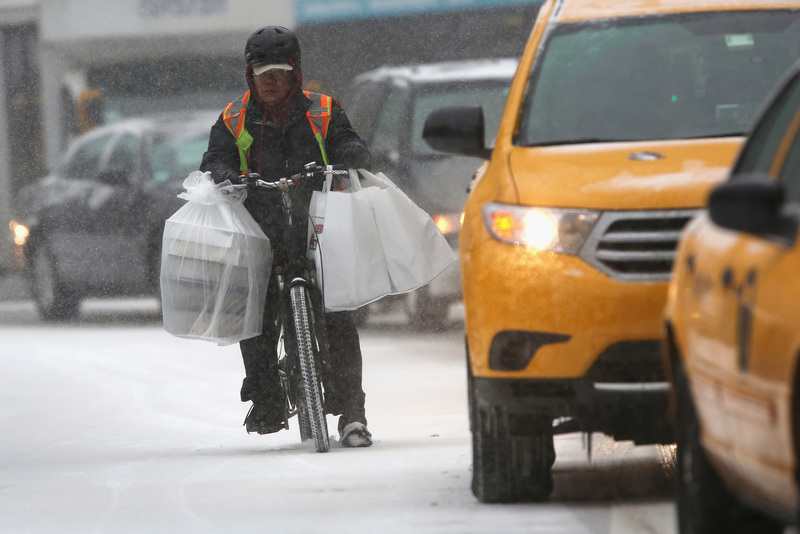 Delivery men and women are working anyway; you'd just washed your hair and were pretty sure it'd freeze solid outdoors; and, because you would tip generously, you were a much better takeout consumer than some stingy, hungry stranger. And now that the Northeast has been overcome by a cold snap, again, the devil on your shoulder wants to do it once more. News flash: You are far from alone. In spite of the ethical debate over whether it is, well, appropriate to make some poor stranger bring you food in the middle of some of the coldest weather seen in the Northeast for decades, it happened. And in New York, it happened a lot. We know this because the New Yorker wrote an entire article on a practice we'll dub Polar Vortex Tipping. GrubHub Seamless compared tipping (by credit card on Seamless and GrubHub, and using PayPal on GrubHub) during the recent polar vortex to other weekdays since December 1st. The 10037 Zip Code—a corner of East Harlem—saw the greatest increase in tipping: twenty-four per cent on January 7th, when the day’s low hit a frigid four degrees. The second-greatest increase was on January 5th, when the residents of 07304, in Jersey City, New Jersey, raised their tips by fifteen per cent. But not every Zip Code participated in the tipping bonanza. Pity the delivery staff who got summoned to 07307, in Jersey City, on January 9th: the tips there were down by more than twenty-two per cent. It makes sense to tip during freezing weather: Tipping is a meant to be reflection of service, and trudging through icy sludge to feed others is a service to humanity, specifically the human that is you. In general, reports the New Yorker, tips were up — as you'd expect — but the trend wasn't consistent throughout New York neighborhoods. For example, we have no idea what possessed the people in Jersey City's 07307 area to tip a fifth less than usual, but we're guessing it has something to do with the fact that they live in Jersey City. It'd be easy to assume that cold weather does naturally lead to higher tips, and that the chillier the weather the better the tip, but research doesn't seem to suggest that's necessarily true. Maybe this is because there's some evidence that rainy, chilly weather leads to less optimism, which might make us more stingy. Or maybe it just hasn't been examined enough. And FYI to delivery folk: Make it very clear that, yes, it's still cold outside, and yes, getting here was a struggle.